This was a fabulous dessert that I made the other week. You all know that I have a surplus of pears this fall. And many were blown off of the tree last month in some terrific windstorms we had. So, to use them up, even the ones which were a bit bruised, has been my mission. I offer this recipe to you, as an alternative use for pears in your menus. It was very delicious, and warming on an early autumn day. Bake at 375 degrees F, for 40-45 minutes in a buttered 9 X 9 baking dish, until the topping is a deep, golden brown. I like to use real butter in the topping mix. It really does add flavor that margarine or oil just wouldn't have. Baking or cooking butter caramelizes the solids (small amounts of protein and sugar from the milk/cream used to make the butter). This caramelization produces an almost nutty flavor in the butter. Pears have a lot of natural sugar to them, and little acidity. So I find I don't need to add much extra sugar to the fruit portion of this dessert, but do like a little tartness from the lemon juice. You could also use a drizzle of honey, in place of the brown sugar, if desired. 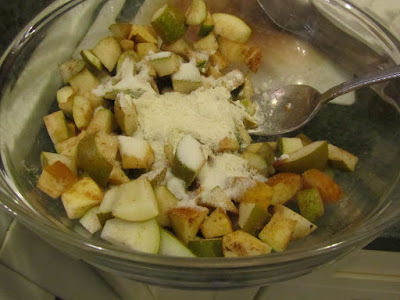 (And as it only calls for 1/4 cup of brown sugar in the fruit part, it would not be costly to sub in honey.) No brown sugar? I don't keep any at home either, but just use a scant amount of white sugar, along with a spoonful of molasses. 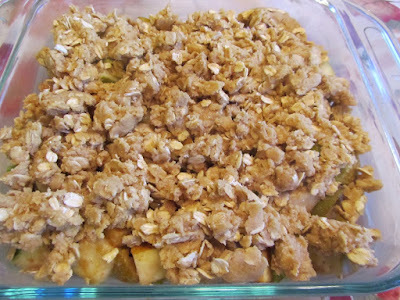 If you have a couple of apples that need baking (I had 2 apples that looked a bit "rough", and wanted to use them up), go ahead and add them, chopped, to the pears. After mixing up the topping, taste it, to see if you need a bit more spice. And as I like to think, "tasting" doesn't really have any calories -- the act of mixing burns them clean off. Ha! Like eating celery, right? Chewing burns off the calories. My husband really loves the crisp topping on this. And I have to admit, it is very yummy! Like crispy oatmeal cookies baked on top of the fruit. I'm curious -- I like pears with ginger, are there any fruits that, in your mind, go well with ginger? And definitely with the upper limits of ginger, always (especially in gingerbrad!!) I like ginger with pears, of course, but also with apples, pineapple, pumpkin, and sweet potatoes. I like it with lemon also (great for colds/flu), and once I made ginger-peach preserves (what I had on hand) that were delicious. Your ginger-peach preserves sounds tasty! I can imagine how those two flavors would blend marvelously. I'm a big fan of pie, but I agree that crisps are soooo easy. By leaving the skins on the pears (or whatever fruit), it's just a matter of chopping the fruit, adding a couple of ingredients, then mixing a quick topping and into the oven it goes. It never takes more than 10 minutes to get a crisp into the oven. Your crisp looks great. I've been keeping a big batch of already prepared crisp topping in the freezer and it's been really nice to make a simple but slightly fancier than normal dessert without the leftovers of a whole pan or pie. I love peaches with ginger, apples too! Really I think any stone fruit or citrus does well with ginger, but berries are more on a case by case basis. I like ginger in recipes that are sweet/savory, too -- like a butternut squash rice pilaf or salad, with pork chops or as part of a fruit sauce over chicken. Hmmm...now I'm thinking of all kinds of fall-like recipes to add to my menu! You're much more organized than I am these days! Good job on the crisp topping in the freezer! Another vote for peaches and ginger together. I use ginger in a few savory dishes, too. It's good in chicken soup, chicken-noodle salad, and teriyaki. Your butternut squash rice pilaf sounds very yummy! It's definitely a fall kind of day, here, with drizzly sort of rain all day. 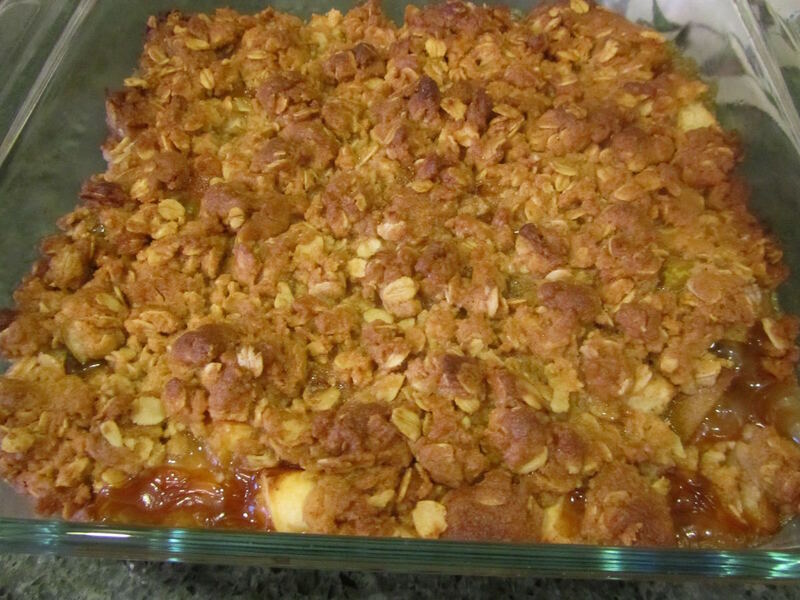 The crisp looks delicious, Lili, as did the cobbler yesterday--Yum! Chinese dishes like to combine ginger with citrus. Actually, ginger is in many Chinese dishes. Also, for me, you put a crisp topping on anything and I'll eat it. I often make a little more than the recipe calls for to have a thicker topping. about the thick crisp topping -- me too! I think that's why my H and I like this one, as it does have a lot of topping for the size of pan. I never seem to have enough pears to bake with. :( Like L&L, I've never met a crisp I don't like, and I love ginger in Asian recipes (and gingerbread/ginger cookies). I worked as a camp cook during high school and college and was nicknamed Apple Kris due to my love of making (and eating) apple crisp. Especially the topping. Yum. I do know what a luxury our abundance of pears sounds like to others. I do love the soft buttery texture of pears. It's a nice contrast to all of the apples that we eat throughout the year. I think I plan dessert so often because it just makes me happy. I try for healthier desserts, though, most of the time -- fruit-based ones. But baking does take a chunk of time. When I bake a pie or pan of crisp, I make it last for 10 servings (2 nights), so we're eating fairly small desserts. Thank you Sara for sharing your experience. Great help to know i can substitute fresh for frozen, of course the finer I can grate, the better. Usually grated from frozen form, I can grate very fine. I don't know why I hesitate to buy the powdered form when we love ginger so much. Recently, we bought some gummy ginger candies and fell in love with it, so I'm thinking maybe I should attempt to make ginger gummies one day (still have doing the gummies on my to do list). Beats paying the rather high store price for these types of candies. I bet the secret ingredient for those delicious gummy ginger candy could be "triple ginger". Have a good day and thank you!! YHF, about the ginger root, do you grow your own? You should be able to in your climate. Another thing you could grow in a pot. And, have you ever tried making candied ginger? Peel a piece of root, slice into 1/8th inch slices or thinner, then candy like in recipes for candied orange peel (simmering in a sugar/water solution). You can then use this like crystalized ginger that you buy. My favorite is in Starbucks-like gingerbread loaf. You do need some ground ginger for the batter of the loaf, but you add small pieces of the candied ginger slices (cut of the slices into small bits) to the batter before baking. Also, bits of candied ginger is delicious added to cookie doughs. My neighbor brought over some chocolate chip cookies that she'd added crystalized ginger root to, and they were delicious! Making candied ginger root is on my holiday plans, for gifts this year. I'll do a post on it when I do. A small jar of crystalized ginger makes a very nice gift for someone who enjoys baking/cooking. lol..I still haven't learned to bake a decent cookie. Very weak in the dessert department but I am learning a lot coming to your blog from you and your commenters. Since having dessert options in our refrig and freezer, I noticed we don't "pig out" on the main dish, that's what we call overeating lol As they say, leave room for dessert!! Lili, no we haven't tried making candied ginger, only pickled. I will love to read your post on making this. The Starbucks-like gingerbread sounds like a good one to make at home, as well as candied ginger in cookies. I do love fruitcakes, so candied ginger sounds great!! i have never given a thought to growing our own ginger root, but thank you for the idea. I will make note of this, and growing in pots would be a wonderful way to attempt growing it. Next time I buy some fresh ginger, I will let it go to shoot. We save our green onion roots when buying fresh bunches and plant those successfully since it yields nice sturdy stalks almost immediately, whereas grown from seed takes forever to generate decent sized stalks. Thank you, Belinda! Me, too! It's like cookies and pie, all in one!